Will Sheridan deliver the essential rescue act? Home /Local News, Local Sport/Will Sheridan deliver the essential rescue act? Three games into his second spell at Chesterfield FC and new manager John Sheridan has not tasted defeat or conceded a goal. Two wins and a draw have given the fans a glimmer of hope and optimism – expectation that this season will end in National League safety and allow for a better effort towards a league return next season. Sheridan’s first game, an FA Trophy game against Bedford FC, a team from two divisions below, saw Chesterfield dominate (as you would expect) and abandon the direct style of football that had become Martin Allen’s trademark. The following game saw an away victory at struggling Aldershot, a credible second half display and two goals from defender Will Evans, one of which any Premier League striker would have been proud of. The homecoming of club legend Ian Evatt and his fair performing Barrow FC side created some nervousness that the Sheridan bubble would burst. 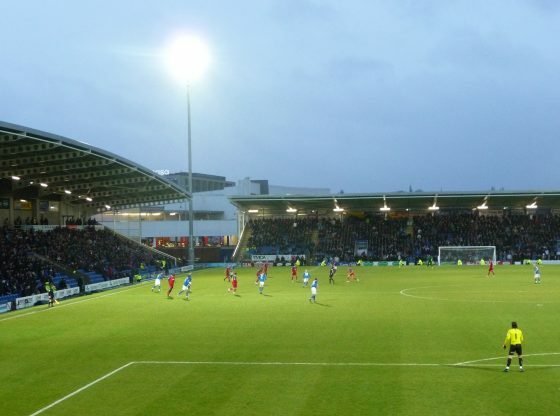 In a close 0-0 game, victory could have gone to either side but the games the best chances were squandered by the energetic Lee Shaw and the experienced Marc Fortune, whilst the referee missed the clearest penalty you could ever see, when the Barrow Goalkeeper elbowed Curtis Weston the ground. Chesterfield fans have seen some green shoots of hope but there is a bated breath feeling still hanging over the club. The anticipated trio of new signings has not yet materialised, with Sheridan giving the impression that his current squad has enough quality to beat the drop. Hamstring injuries to Forutne and Brad Barry, however, seem to have promoted a transfer rethink and the rumour mills are suggesting that Scott Boden will come in from Gateshead at some point this week. This weekend sees a break from league action and the chance to progress in the FA Trophy with a home fixture against Brackley FC. Fans will be hoping to see another victory and signs that Sheridan’s style can galvanize a squad that has demonstrated such fragile confidence at home. Will Scott Boden become a Chesterfield FC Legend?